Máirín de Valéra, Professor Emerita of Botany at University College, Galway, died suddenly at her home on 8 August 1984. 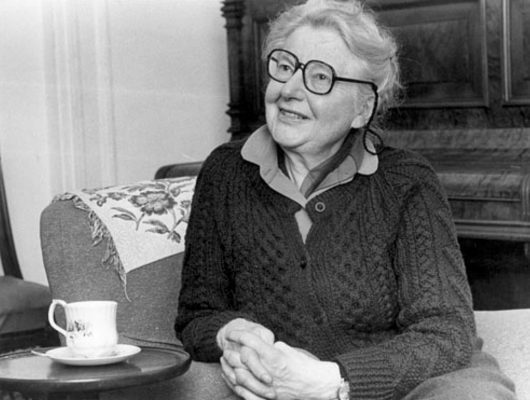 Born in Dublin on 12 April 1912, the elder daughter of Éamon and Sinéad de Valéra. she was educated at the Loreto Abbey, St. Stephen’s Green, Dublin, and at University College, Dublin, where she graduated in 1935 with a first class honours B.Sc. In the following year, having obtained the degree of M.Sc., she won a Travelling Studentship of the National University of Ireland which enabled her to work initially at the University of Leeds (1936-7) and then at the University of Lund, Sweden (1937-9). At Harald Kylin’s laboratory in Lund she worked alongside many who subsequently gained fame (including Egil Baardseth, Carl Bliding, Tore Levring, George Papenfuss, Svante Suneson). This pre-war interlude fostered Máirín’s lifelong interests in, and dedication to, phycology. Returning to Ireland in 1939, immediately prior to the outbreak of World War II, she was appointed Assistant in what was then the Department of Natural History at University College, Galway. For several years, as the only botanist in the Department, Máirín was responsible for teaching all courses in the plant sciences. This in itself would have been a formidable task, but every class had to be taught twice, through English and through Irish. In 1961, the Department of Natural History was replaced by separate Departments of Botany and Zoology and, in the following year, she was appointed to the Chair of Botany. Under her direction, the Department of Botany consolidated its activities and expanded considerably. With regard to Máirín’s research and publications, the earlier papers published or sent to press while at Lund predominantly concerned morphology or physiology, although in the summer of 1938 she returned briefly from Lund to Ireland to make extensive collections in Galway Bay which formed the basis for a paper more like those of her later years. Subsequent to her appointment at Galway in 1939, there was only one publication during the next decade, the rather significant (but frequently overlooked) paper dealing with the first record for the occurrence of the red alga Asparagopsis armata in the British Isles. This dearth is understandable, bearing in mind that Máirín was an isolated phycologist in a Department then with minimal facilities where she carried a horrendous teaching load, and in a country which, although neutral, was enveloped for many years by the Second World War, so that resources of all kinds were at a premium. Whatever spare time there might have been was largely spent assessing and evaluating the potential resources of Gelidiaceous algae throughout the west coast of Ireland as sources of agar. Due to wartime restrictions, this work was largely undertaken with a bicycle as the only means of transport. The vast, amount of work undertaken produced some technical reports, although no formally-published papers. It did, however, provide her with an unequalled knowledge of marine algae on the west coast of Ireland, an area that had been underworked since the pioneering studies of Cotton at Clare Island many years earlier. The information on Gelidium and Pterocladia was the basis for the preparation of a dissertation for which M~iirin was awarded the Ph.D. degree of the National University of Ireland in 1945. It would seem that Máirín attendance at the initial “unofficial meeting of phycologists” at Bangor in 1951, at which it was decided to form the British Phycological Society, was responsible for her renewed interest and activity in terms of phycology. Subsequently, her research was largely concentrated on field studies, particularly on the distribution, ecology, life histories, and phenology (both in terms of occurrence and reproduction) of marine algae so that there was a constant production of papers based essentially on the work of earlier years but reinforced by further field investigations. Máirín’s field knowledge was incredible as was her knowledge of precise locations and time of occurrence of both common and rare species. Some of this information was included in her “Topographical Guide to the Seaweed of Galway Bay …”, written as a handbook for participants at the Third International Seaweed Symposium held in Galway in August, 1958. It is not what she produced that matters, because Máirín had been constrained in so many ways and for so long, but what she did for the furtherance of phycology. Mfiirin’s hospitality and knowledge were beyond belief. To one of us, coming to Galway in the immediate post-war period, the offerings of delicacies not seen for a decade were unforgettable whilst the distilled knowledge of algae, their occurrence, their behaviour, and what it all might mean was unbelievable. In general, regardless of the particular requirements of the many marine phycologists who visited Galway, the location of rare or interesting material was described in detail so that all came away with a deep respect for her abilities. If one were to ask where to find a particular species, the reply would be immediate “… over the bridge, turn left, and there is a large pool by a big boulder…” and, sure enough, there it would be. To ask a question was to initiate a stream of detailed information that only the most specialized could appreciate. One of her last major undertakings was her participation in the establishment of a field station on the shores of Galway Bay for which Clare County Council provided the funding. Máirín chose a site near Finavarra, an excellent choice based on her knowledge of marine algae of the west coast. Some 400 species of marine macroalgae have now been recorded from the immediate area, many of which are known in Ireland only from this locality. Finavarra Station was a great source of pride to Máirín and its continuing availability to phycologists and workers in other disciplines is a fitting monument to her memory. Máirín belonged to that early generation of formidable phycologists who could, if they so chose, make anyone quake. Equally, she could be extremely charming and her generosity knew no bounds. Once one had secured her friendship, it was there for life; she gave freely of both her knowledge and of her possessions. Throughout her life she enjoyed robust health although it was important to be on her right side as, in her later years, she was quite deaf in one ear and had considerable difficulty in hearing people on her “wrong” side. Máirín belonged to a large close-knit family, intimately involved with the foundation of the Irish state. Her father was founder and, for many years, leader of one of the main political parties. He was twice Taoiseach (prime minister), twice President of the Irish Republic, and for many years was Chancellor of the National University of Ireland. Máirín, however, strenuously avoided the limelight, reflected or otherwise. In 1977, she retired as Professor and Head of the Department of Botany and was appointed Professor Emerita of the National University of Ireland, but continued to be active after retirement, frequently visiting the Department and taking a keen interest in phycological activities. She bequeathed her herbarium and books to University College, Galway where they are now housed in the Department of Botany. One of us was happy when she agreed in 1982 to the naming of a new genus of red algae (Devaleraea) in her honour. In 1956, Mfiirin was elected to the Royal Irish Academy. She was a founder member of the British Phycological Society, having attended that initial meeting in Bangor in 1951; in 1969 she was elected Vice-President of the Society; and in 1977 was made an Honorary Life Member. Máirín will be missed by her students, colleagues, and by fellow phycologists around the world. Suaimhneas síoraí da h-anam (eternal rest to her soul). FiJrh., 9:91-104 [Reprint pp. 1-14]. Asparagopsis armata Harv. on the west coast. Ir. rufolanosa in Ireland as compared with Spain. Collnea bot. Barcinone, 5: 377-380. Ireland. lr. Nat. J., 12: 182-187. Symposium at University College, Galway, 1958. Ir. Nat. J., 13: 18-19.
shores of the Burren. lr. Nat. J., 13: 168.
dichotoma J. Ag. Ir. Nat. J., 15: 151-152. Kerry. It. Nat. J., 16: 53. Burren grykes. It. Nat. J., 19: 436.
editor). J. anim. Ecol., 33: 165-210. Wildem.) Printz sensu Khan. Ir. Nat. J., 16: 14.
east and west coasts. In A View of Ireland. the Advancement of Science, Dublin. De Valéra, M., PYBUS, C., CASLEY, B. & WEBSTER, A.
northern shores of the Burren, Co. Clare. Proc. R. It. Acad., 7911: 259-269.
torulosum Kiitz. and G. melanoideum Schousb.